The term “Built-up roof” (BUR) is a generic term for roof systems typically containing multiple layers of hot asphalt sandwiched between layers of reinforcing glass roof felts, covered with a final finish layer of asphalt and gravel. Built-up roof systems have been around in some form or another for almost 200 years. Known as the most traditional roof system, it has a typical life expectancy of 20-40 years. The multiple layer redundancy and tough surfacing make the Built-up roof the most resilient system available. Along with its reputation comes the price tag. Typically, a complete tear-off with a Built-up roof system installation is the most expensive option available to a building owner. While all roof systems are good roofs if installed properly, the Built-up roof is known as the best, and should last the longest. 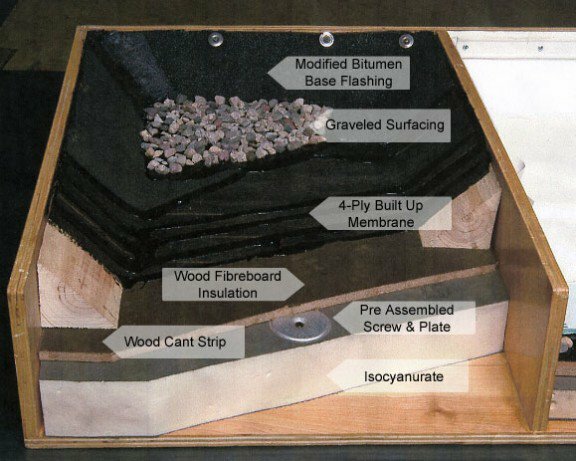 This system consists of a traditional roof mat, comprised of four layers of asphalt moppings and four layers of reinforcing felts. There are two grades of reinforcing felts—the standard type IV felt plies can be warranted up to 12 years. Premium type VI felts have a higher tensive strength, and therefore can be warranted up to 20 years. Modified bitumen base flashings are installed at perimeter and curb flashings, adding additional redundancy of crucial locations. The roof is then flooded with hot asphalt and roofing gravel is broadcast into the asphalt providing a protective surface for both traffic and ultra violet rays from the sun. Similar in construction to a built-up roof, the roof mat is comprised of multiple layers of asphalt and reinforcing felts, either type IV or type VI, depending on warranty periods. The main difference is in lieu of the graveling process, the entire roof system including the field and base flashing locations are covered by a layer of 160 mil mopped in place modified bitumen. This system works well for mid to high-rise buildings where access is difficult.